Unique Events Take Flight at the Museum of Flying! 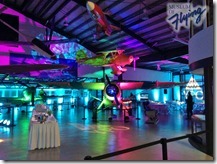 The Museum of Flying is the venue to make your special event memorable. 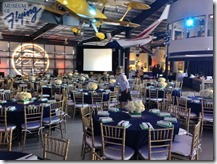 Receptions, conferences, meetings, elegant dinners, corporate parties, seminars, cocktail events, fundraisers, charity galas and holiday parties are all first class at the Museum of Flying. Depart from the boring and mundane and book your next conference, meeting, or seminar at the interesting and exciting location, at the historic Santa Monica Airport. 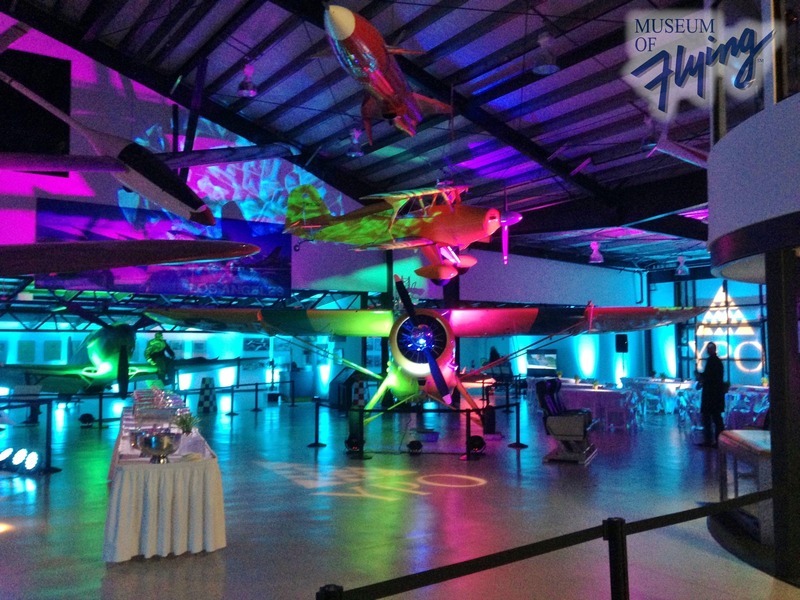 Your guests can explore and discover an array of aircraft, aviation themed exhibits, aviation memorabilia, artifacts, and aviation art while they learn, mingle, or socialize. 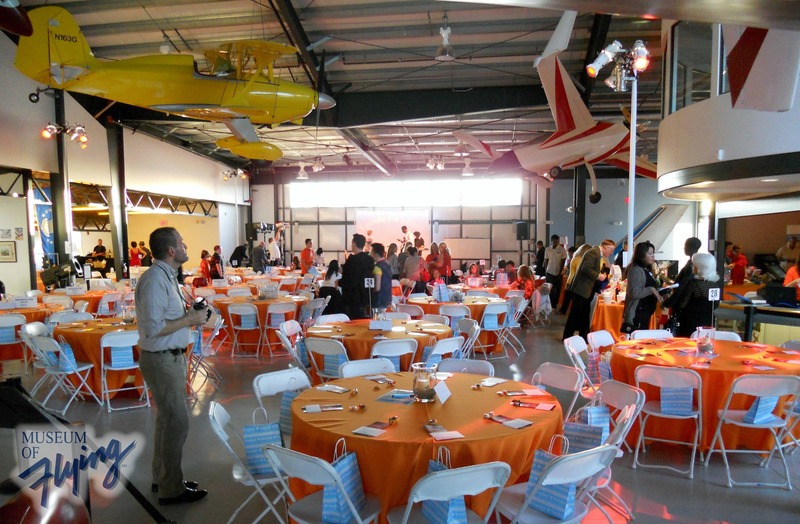 With accommodations for up to 600 attendees for conferences, meetings, and seminars, the Museum of Flying is an ideal location to allow your functions to take flight in an interesting and unusual venue that’s unlike any other in the greater Los Angeles area. Your attendees will be energized, inspired, and engaged to gain the most of your function. Located at one of the oldest continually operating Airport in the United States, the Museum of Flying presents the rich history of aviation as it relates to Southern California with an emphasis on the Douglas Aircraft Company which called the Santa Monica Airport home for more than 40 years. In fact, the Douglas Aircraft Company built more than 10,000 aircraft here during World War II. 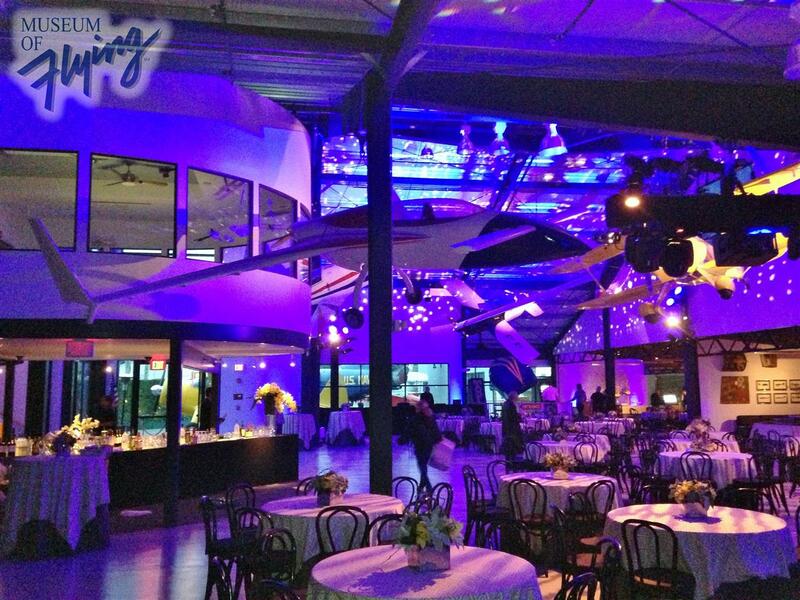 Make your next function truly memorable by scheduling your event at the Museum of Flying! 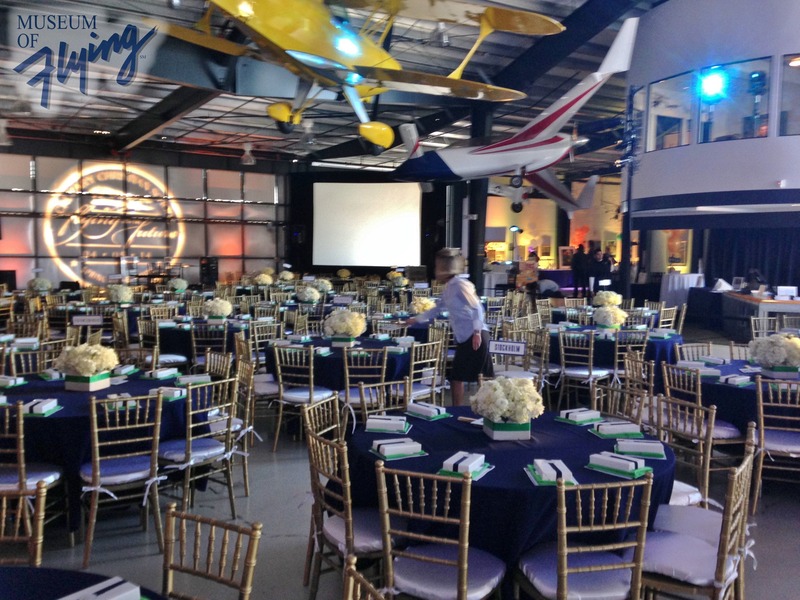 Check each section below for details on hosting your event at the Museum of Flying. 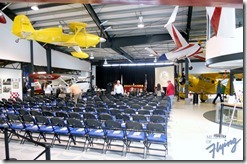 With accommodations for up to 600 total attendees for conferences, meetings, seminars, receptions, sales meetings, ceremonies, product announcements, and luncheons, the Museum of Flying is an ideal location to allow your functions to ‘take flight’ in an interesting and unusual venue that is unlike any other in the greater Los Angeles area. Your guests will be energized and inspired to engage and get the most of your function. Located at one of the oldest continually operating Airports in the United States, the Museum of Flying presents the rich history of aviation as it relates to Southern California with an emphasis on the Douglas Aircraft Company that called the Santa Monica Airport home for more than 40 years. In fact, the Douglas Aircraft Company built more than 10,000 aircraft here during World War II. *Each event is unique, maximum capacities are determined on a case by case basis. There is more than 6,500 sq. ft. of usable floor space on the first floor. Smoking is prohibited inside and outside the Museum. The Museum of Flying does not provide food or drink services, so you must contract separately for catering services. The Museum also reserves the right to determine the areas where food and drink service is permitted. The general sobriety of guests is the responsibility of the renter. Alcoholic beverages may not be served to minors. Public intoxication or other disorderly conduct, which jeopardizes the Museum, will not be tolerated. Upon execution of the Facility Rental Agreement, renter shall provide to the Museum a separate damage deposit determined by the type of event. Should damage occur to the premises, the deposit will be kept, and the Museum will forward a detailed accounting of such charges to the renter. Should the premises be left in good condition, the deposit will be returned to the User via U.S. Mail within two weeks after the event. Should excessive damage occur, such items will be documented and invoiced to renter. Payment of such excessive damage is required within thirty (30) days. Should the renter question such charges, they should contact the Special Events Office at (310) 398-2500 x113. If the event must be postponed, the payment will apply to the later date. If the event is canceled, written or e-mailed notification must be received by the Museum at least 90 days prior to the scheduled date in order for the User to receive a full refund. If the event is canceled less than 90 working days prior to the scheduled date, the User forfeits ½ the rental fee. Postponement and/or cancellation must be in writing or an e-mail from the Authorized Contact Person for the User. 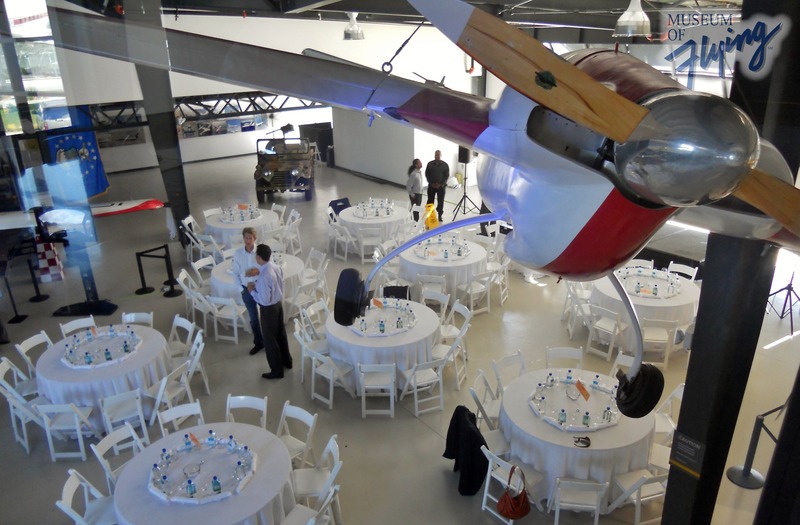 We understand that you may wish to have aircraft and exhibits relocated to accommodate your event. At times, the Museum is able to move aircraft and exhibits to different locations. Please be aware that we are a Museum and our primary responsibility is to the artifacts. Movement or removal of aircraft or exhibits cannot be guaranteed and will be at the discretion of the Museum and may incur an extra fee. For all events, a walk-through with all involved parties (Caterers, Rental Company, Florists and Special Events Office) is required, and must be scheduled at least one (1) week in advance of the event. The Museum requires 48-hour notification of any event changes. Nothing may be taped, stapled, nailed or attached to any part of Museum property, only freestanding equipment or decorations may be used. This equipment must be itemized and a copy presented to the Special Events Office prior to the date of the event. ALL DÉCOR AND OR EQUIPMENT MUST BE PICKED UP THE NIGHT OF THE EVENT OR SPECIAL ARRANGEMENTS NEED TO BE DISCUSSED WITH THE SPECIAL EVENTS OFFICE. Lighting may only be installed by a professional lighting company. Should any special electrical needs be required, the Museum must be notified at least two (2) weeks in advance. Electrical circuits are limited and special equipment requires prior approval of the Special Events Office. The use of any additional electrical generators requires a permit from the City of Santa Monica. Breakdown must occur immediately after the event and all rental and decoration items must be removed. Renter and Caterer will ensure thorough clean up, including depositing all trash in the correct containers or carrying it away. In the event of non-compliance, the Museum reserves the right to remove these materials at the renter’s cost and liability. At the end of the event, break down must be completed within 1½-2 hours. Events that require a longer break down time will be charged an additional fee. The Museum has a very small lot in front behind its bollard line. The lot beyond that adjacent to the DC-3 Monument is owned by the city. It is the responsibility of the client to contract with the city to secure an appropriate number of spaces in the surrounding Airport parking lots to accommodate their event. The Museum’s Special Events office will do everything possible to assist the client in securing the space needed for attendee’s cars. All printed materials, media announcements and other public relations communications relating to the event that include the Museum logo are subject to the approval of the Museum before they are in the final printing and/or distribution stages. The Museum is generally available for rental Monday-Sunday. All events are scheduled within the discretion of the Museum. The selection of a date does not itself hold that date indefinitely. The Museum may hold the requested date up to two weeks from initial contact with the Special Events Office. To reserve an event date, a deposit equal to fifty percent (50%) of the facility rental fees, plus the damage deposit and cleaning fee must be paid and the Facility Rental Agreement must be signed. Final payment is due 14 days before the event. Monday through Thursday pricing starts at $3,500 per day for up to 300 guests for a 10 hour day from load in to strike. For larger groups or longer setup to strike hours rates will vary depending upon various factors and group size. The Museum can accommodate up to 400 guests for a formal seated function or up to 800 for a reception style event. Friday through Sunday pricing starts at $4,500 per day for up to 300 guests. For larger groups rates will vary depending upon various factors. Special Event Permit Application Fee $554 (for all events of 150 persons or more). Parking Lot Rentals $400 for 3050 Airport Avenue (135 spaces just west of the Museum). Directional Parking Attendants $400 (2) (City requirement through Chuck’s Parking). 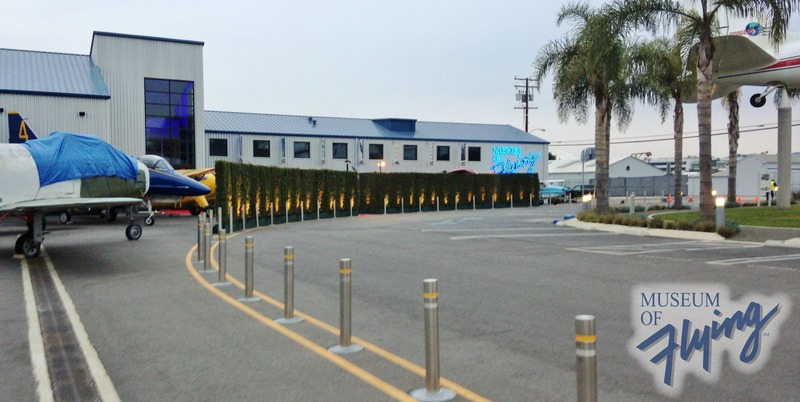 Additional parking lot rentals based on availability for an additional rental fee. Any and all additional City of Santa Monica fees or costs are the responsibility of the client. Some larger events of several hundred persons may require a Fire Safety Officer from the Santa Monica Fire Department estimated at $700. In some cases, a police presence may be required at an additional cost to the client based on the number of Officers that may be ordered by the Santa Monica Police. Use of Propane or a Generator will require a Fire Safety Officer. Disclaimer: All businesses and vendors doing business in the City of Santa Monica are required to have a CURRENT SANTA MONICA BUSINESS LICENSE. The Museum assumes no responsibility on performance or pricing. Vendors that work at the Museum are independent. All pricing, licenses, insurance, contracts and performance are the responsibility of the client. Special event rentals are available 365 days a year. Check our public calendar for planned events and temporary closures. Please contact us for information on venues and availability. Events can be held on any given day between 7:00am to 11:00pm. Early morning events would likely require a previous day setup. Email: venues@museumofflying.org – or fill out the form below, and our event coordinator will contact you. When leaving a message or making a query by email, please include the date you’re interested in, type of event, number of guests, food prep and parking requirements. If you’re interested in renting our MaxFlight Simulator, please include that in your message. Are you bringing hired entertainment?